There are simply endless ways to work with the basic Anglican/Protestant rosary as it is laid out. The wonder of it is that you can bring to the process whatever prayers speak to your own spirituality. 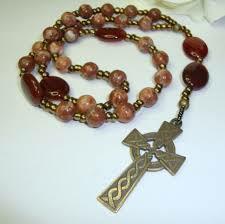 Having said that, as you will have observed from my own adventure into creating rosaries, simple is best. When the set-up gets too complicated, pull it back, and re focus. The ideas below are ones I would like to test out. But it is best to work with your own interests and needs when creating a personal rosary. And too, as you have seen in my samples, there really is no rule about staying within this set pattern. You can create your own. “And all will be well, and all will be well, and all manner of things will be well.” With that as the main prayer, four of her other prayers could surround it. J. Philip Newell has lovely Celtic devotional books with short phrases, prayers, and scriptural references. 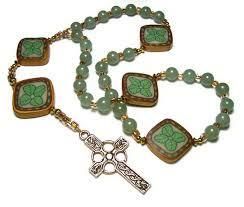 A rosary of found materials, or more natural beads would tie in with the Celtic pastoral focus. John O’Donohue’s book of blessings, To Bless the Space Between Us, is filled with exquisitely crafted blessings of varying lengths. The blessings cluster around themes - custom made for rosaries. Esther de Waal’s book, The Celtic Way of Prayer The Recovery of the Religious Imagination, is full of possibilities. John Dear assembled all the questions Jesus asks in the scriptures in his book The Questions of Jesus, Challenging Ourselves to Discover Life’s Great Answers. They might make an interesting set of prayers. Jesus Loves Me This I Know. Not bad for some clear focus. ‘Do Not Be Afraid’ – now that’s a great rosary theme. The First Principle and Foundation of the Exercises, annotation 23, would be a good place to begin. "We must make ourselves indifferent to all created things, as far as we are allowed free choice and are not under any prohibition. Consequently, as far as we are concerned, we should not prefer health to sickness, riches to poverty, honour to dishonour, a long life to a short life. The same holds for all other things. Our one desire and choice should be what is more conductive to the end for which we are created." Louis M. Savary, who wrote The New Spiritual Exercises, In the Spirit of Pierre Teilhard de Chardin, begins in a different place with The Exercises. His First Principle and Foundation reads: "You were created to make a unique contribution to the great evolutionary project initiated and continually supported by God, namely bringing all creation together into one magnificent conscious loving union." His short pieces of thought and prayers would make a good base for a rosary. In each of the twelve steps of AA there is a prayer. I wonder that a set of prayer beads might be helpful to learn them all, with some repetitive prayer in between. I think I would like to do this one. Or you could do all the steps, with a favourite 12th step prayer within it. This is a treasure trove for those who prefer more formal prayers - beautifully sculpted, with the patina of long tradition. Short phrases from key teachings with a personal prayer in between, or the Jesus prayer. This is my desert island book. CLICK ON IMAGE FOR RESOURCES ON HOW TO MAKE YOUR OWN ROSARIES. Such beautiful writing, it is all poetry and prayers. People, nations – just as they are.